KARACHI, Sept 14: With a machine-gun in the back seat, his foot on the accelerator and wearing “Top Gun” style sunglasses, Azfar Mahesar pushes deeper into the heart of one of Karachi’s “Talibanised” areas. “This used to be a war zone, but we have liberated it,” says the slightly chubby policeman with pride as his vehicle races through the city of 20 million, where Afghan intelligence says former Taliban leader Mullah Omar made his home in 2013. Over the past few years, one word has been on everyone’s lips here: “Talibanisation”. If the remote mountains that straddle the Pakistan and Afghanistan border have been the militant group’s playground, Karachi has been the insurgents’ hideout and cash-cow. The Taliban dug deep into areas populated by ethnic Pashtuns, creating virtual “no-go zones” and terrorising the local population with extortion and kidnappings for ransom to provide funding for their Mujahideen. But, say Pakistani officials, that has all changed now. “Talibanisation in Karachi has died down,” says Mahesar, a former soldier turned senior police officer in the most dangerous, western part of the city. “I can say very confidently 70 to 80 per cent (are purged). There are a few remnants in Karachi but they are not as capable of coming back with the efficiency that they had a year or so ago,” he adds. Today, policemen wearing flak jackets are advancing deep into the bowels of one of the remaining “no-go zones”, through dug-up streets and up rocky hills that mark the city’s western edge. “This was a local Taliban HQ,” one says as he stands before a pulverised hovel. The Tehreek-e-Taliban has been the country’s public enemy number one since its formation in 2007. Last December, the group carried out its deadliest attack ever, on a school in northwestern Peshawar, killing more than 150 people, mainly children. In response, the government gave the police and paramilitaries permission to lay siege to Talibanised areas, killing hundreds of suspected insurgents, without worrying much about due process. “Peshawar opened the world’s eyes. We had to act, even if it meant killing a thousand civilians,” says one policeman on the mission. All this occurred as the military made gains in North Waziristan, from where the Taliban of Karachi received orders. 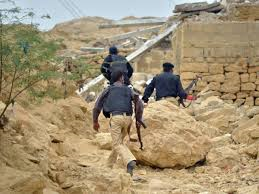 “The disconnection between Karachi and Miramshah (capital of North Waziristan) has helped law enforcers to keep the Pashtun parts of the city safe and clear of the militancy,” said Ziaur Rehman, an expert on security in Karachi. Taliban fighters instead sought refuge in neighbouring Afghanistan, and Pakistan is now facing its lowest levels of terrorist violence in almost a decade. In the Manghophir district of Karachi, residents now say business is picking up. Extortion and racketeering by the Taliban — or criminals posing as them — is now almost a thing of the past. “God be thanked that the Taliban have gone. People were scared, they wouldn’t go out to the markets,” says elderly Fatima, dressed in a large and multicoloured shawl, in front of the shrine of the Sufi Saint Pir Haji Mangho — which serves as a barometer of militant presence. Mystic and moderate Sufism were once the predominant forms of Islam practised by people in the country, but the sect is seen as heretical by the hardline Taliban. This mausoleum, which was last attacked by militants in 2014, is guarded by crocodiles swimming in a green pond. In the hardscrabble Metroville district, where children bounce on a trampoline that has seen better days, Abdul Razzaq Khan, chief of the Jamaat-e-Islami political party in west Karachi, hails the anti-Taliban operation. “God knows where they’ve gone. They’re maybe hiding out here, or they’ve returned to where they came from, that’s an unanswered question,” he says, though he still believes criminals posing as Taliban were a bigger threat than the group themselves. But for Rauf Khan, a member of the secular ANP party, who last April survived the latest of several attempts on his life by militants, there is no doubt things have changed drastically. “Now we are mentally liberated. It somehow hasn’t felt this way in 15 to 20 years,” he said. This entry was posted in 9/11, Pakistan Politics. Bookmark the permalink.